Ever throw a bomb at everyone while they're waiting for the train in Kalimari desert and then just blow on by ..? Just did that lol. If the gameplay is as awesome as the graphics than we got a winner! So Nintendo has gotten in the habit of using last gen controls? Sweet, I liked the Wii wheel style of driving! It's funny how the character roster for Mario Kart 8 is already better than Mario Kart 7's. I have low expectations for this one. I doubt it will be worth the wait. Looks better than Mario Kart 7 at least. I just had a thought....A most wonderful thought. If they get the Combat Maps correct, we could see some brilliantly interesting courses to Balloon Battle on. Despite me preferring handheld versions than console, I kinda agree...lol. I enjoy 7 and all of its tracks for sure, but...eh...character selections was bleh. Kinda wished they had more/new power-ups too. I played the demo at best buy and enjoyed it.I thought the graphics were amazing. I had the chance to play this recently at Best Buy and it's AMAZING. The game flowed very similar to Mario Kart Wii and 7, with the addition to the smoothness that I saw in Sonic Racer. The hover/gravity cars were also an awesome new element. I played as Mario through the course and I had to drool in spots that were in HD. The game is also 1080P! I can't wait to buy this game day one. I wonder if Nintendo is bringing back "mission mode" from MKDS? I thought that mode was both unique and fun. "If it doesn't have what I want, I will complain even though the game's still looking really good." You're expecting stuff that most likely won't happen. We've seen one trailer and the game doesn't come out 'til 2014. At least have a little bit of hope and instead of expecting what you want; just expect it to a great game. but its ALWAYS the same. After playing Modnation Racers on PS3 I just saw the possibilities of a community driven funracer, something that would fit very well with Mario Kart. if you're happy playing the same game every few years with updated graphics and a few new tracks, fine, but I'd love it to grow beyond that. Modnation Racers was horrible -_- Horribly limited track themes and designs, bad controls, and very little charm. But a community driven Mario Kart could be cool. 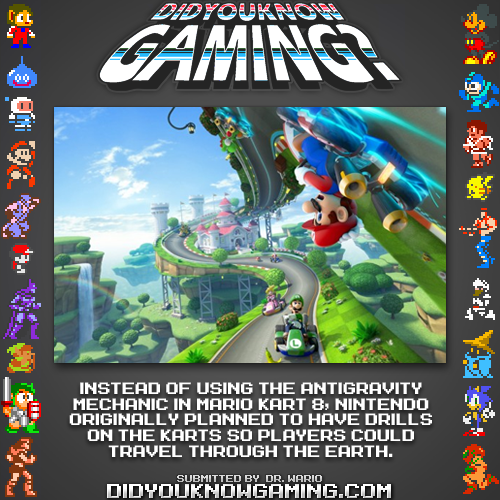 Mario Kart: Drill Dozer Edition? Hopefully they let you collect more than 10 coins this time. It was stupid playing coin battle with a limit of 10 coins..